Happiness is mind-boggling. Is there anyone that you know who does not strive to be happy? Entire industries have been born and flourished in the promise of providing happiness and yet I feel we are unhappier than ever. We are unhappy when we do not have everything we imagine we should. Hurling myself down the jungle during a trek in Northern Thailand. We had climbed up one side of the jungle and now is was time to come down. The descent was steep and there was no path as such, just a smoother way to fall. I let the vertigo pass over me and soon realised my jungle-surfing, which was really m holding onto to one bamboo tree whilst I stretched my little legs as far as possible to the next, was not the best tactic so I was quickly forced to hash out a Plan B. Plan B was amazing; it involved me falling from the mountain height one tree at a time. It meant having to let go and trusting in gravity for splits of a second until I slammed into my next stable post. Each time I rested against the bamboo trunk I had to count myself down to let go again, a continuous battle of self-will and adrenalin. At some points we had to abseil down using bent tree branches, and there were times where I did slide down on my bum (on purpose of course).Whilst I had started the descent half-terrified by the treacherous route before me, the journey to the bottom was amazing. I was in a world of my own trusting in Nature and stretching my limits; I smiled the whole way down. Jumping from rock to rock on the quest to find a waterfall, I found my element surrounded by tributaries of water as I run against the current. I was the first one of the group to reach the top and when I arrived sweating from the trek to see a group of tourists just staring into the waterfall’s pool, I stripped and jumped in. Yes it was cold, freezing even, but as I lay back in Nature’s bathtub I was submerged into Happiness. Everything was still, even the cascade of water that came crashing down, and there was silence. I’m not sure how long it lasted as soon enough the rest of my group caught up with me and one by one they reluctantly plunged into the cold. 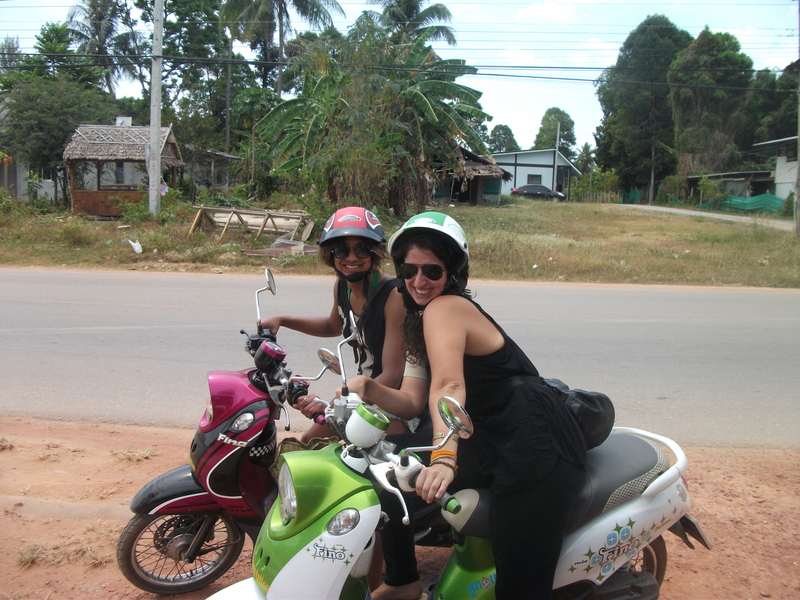 Riding on the open road around the island of Koh Lanta. I had rented a scooter for the day encouraged by my new friend Lau. Just before we set out for the journey from our hostel I remember the concerned look on Welsh Joe’s face as I asked him how to remind me how to accelerate and break. I had ridden a scooter only once before 2 years earlier in Uruguay; it would have been a genuine Motorcycle Diaries moment had it not been for my Spanish companion holding on to me, so my riding skills were more than a little rusty. Nevertheless, after a tentative few hours during which I fluctuated between snail’s pace and speeding, I finally found my happy reward. I felt it in the warmth of the sun as I chased it up and down hill roads, I felt it in the breathlessness that stole upon me as the wind whipped around my body, and most worryingly I felt happiness in the moments when I jerked back to reality after realising my mind had drifted to where? Lau and I didn’t arrive back to the hostel until well after dark, we followed the sun all the way to its bed as we ate dinner at a restaurant on the cliff’s edge. We drunk drove, our bellies filled with laughter and Thai foods. The goddess Happiness was in full flow that day. My motor skills improved vastly during that day, I may have had one tiny scrap with an offensive tree but by nightfall I was such a pro that an elderly, and possibly blind, Thai gentleman mistook me for a taxi-bike. After giving me the instructions (of which I obviously understood none of), he jumped on the back of my bike and not even his daughter could persuade him that I was in fact a tourist so she too jumped on. I decided I would play along being giddy on Happiness but I could barely start the bike with the new combined mass. He laughed hysterically when his daughter explained the mistake. I’m still laughing. If I were to define Happiness for me, the recurring theme seems to be Freedom (from thought?). Happiness takes all forms for everyone, which underpins it as an elusive commodity. We are set to fail if we continue to attempt to purchase Happiness, it’s not for sale it just finds you. Take a minute to think what makes you Happy, don’t be surprised if it is something as simple as your mum’s home cooking. Categories: Humour, Life, Travels, Uncategorized | Tags: adventure, Jungle trek, koh lanta, Krabi, motorbike, Thai language | Permalink.